Red and processed meat may contribute to colorectal cancer through generation of carcinogens, including NOCs, heme iron, sulfur-containing amino acids, and saturated fat. Overweight or obesity as well as chronically increased levels of insulin also may have a critical role. Despite high saturated fat content and its role in increasing insulin-like growth factor 1 (IGF1), dairy products may inhibit colorectal carcinogenesis via a variety of bioactive constituents: calcium, vitamin D (when fortified), CLA, butyric acid, lactose, and lactic acid bacteria in fermented milk products. Fruits and vegetables contain various components with antineoplastic potential: fiber, antioxidants, B vitamins, and glucosinolates (in cruciferous vegetables). 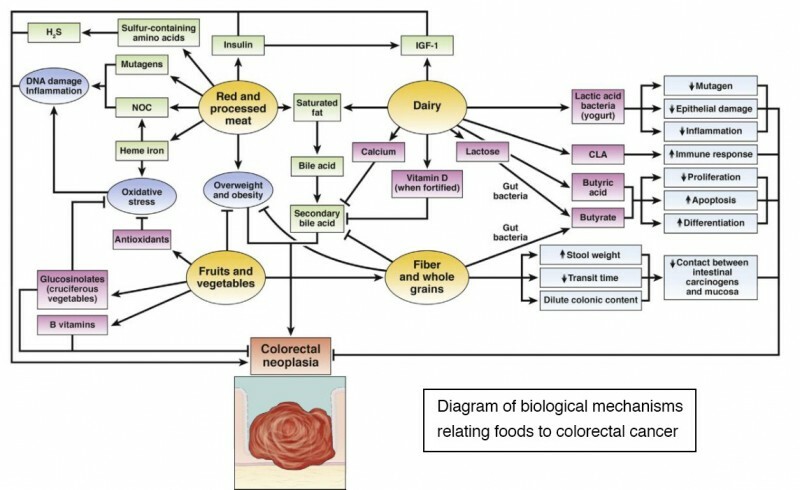 Potential anticancer mechanisms of fiber include binding or diluting secondary bile acids, increased stool weight, decreased transit time, and bacterial fermentation leading to reduced colonic luminal pH and production of butyrate, which has antineoplastic properties. Fiber, fruits, and vegetables also may influence carcinogenesis through decreased adiposity.